Giving Thanks–Memories of an Expat living in Anjuna, Goa – Goan Good! It’s Thanksgiving, everyone! Happy Turkey Day! Today is the day that I miss America the most. Being an ex-pat in a tropical, foreign culture has perks like swimming in the ocean in the middle of what would be winter, but it also doesn’t have things like mimosas all day, or hot cider by the fireplace, or conversations that end up underneath the coffee table laughing hysterically, or eating seasonally loved foods with seasoned loved ones. Sure, I could have people over for dinner, but it wouldn’t be the same. It wouldn’t be like home. So today, I am a little wistful. I’m a little nostalgic. . .and I miss all of you, including that silly turkey. For years, I was blessed to host one of the most amazing Thanksgiving dinner parties for sometimes up to 25 people. I had friends come from all over the country, all over the city, and I got to hold space for a whole tiny community in my comfy home. Sometimes we all ended up on the floor laughing from eating too much, and other times we ended the day with a musical jam, but it was always a day filled with so much love, gratitude, abundance, and comforts. It was pure bliss and community for an epic day, and I will be thinking of all of my American friends as you celebrate today. I am thankful for all of the people that I got to share this very special day with over the years, and I dream about having you all at my table again sometime. In honor of my nostalgia, I’ve prepared some PG memories for your viewing pleasure. 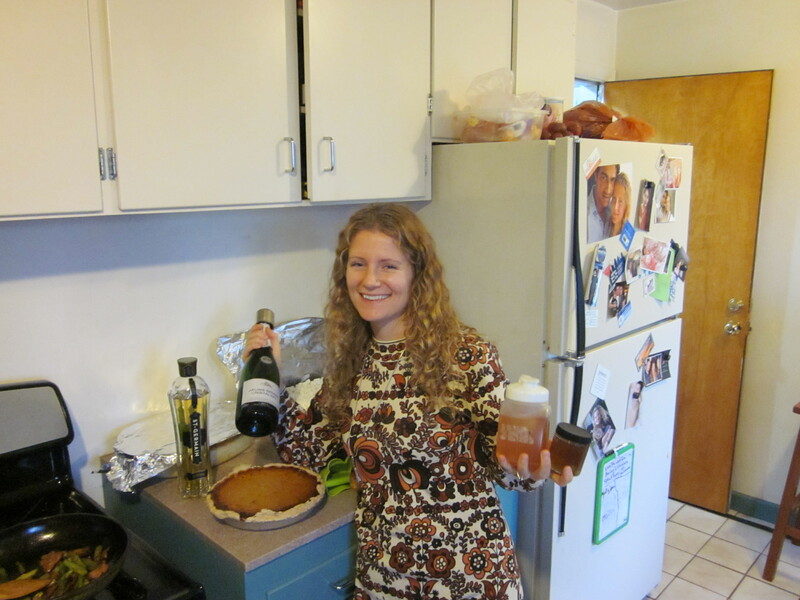 . .
What else does a girl need besides pumpkin pie, champagne, and a vintage merino wool dress (from Goodwill, of course)? And my grandmothers’ crazy looking, yet so very delicious jello molds. . . on my ever so loved thrift store platters. . .
And the glorious, glorious spread of bountiful foooooooooood. . . . .
Around this time, people often ask me “But what is Thanksgiving?” I suppose it’s different to everyone, but to me, it means having a day to cherish those you love, or need to be loved, and being raised by a crazy Jewish mother, loving people means FEEDING them! It’s also about spending quality time with friends or family you might not see regularly, and spending a little extra time creating traditional or new dishes that are enjoyed by a group. It’s about coming together, catching up, sharing sacred space, and being thankful for the little things in life. It’s also how I honor and remember the loved ones in my life that are gone but not forgotten. . . like when I make my grandmothers’ recipes, or bust out my grandfathers’ brandy. 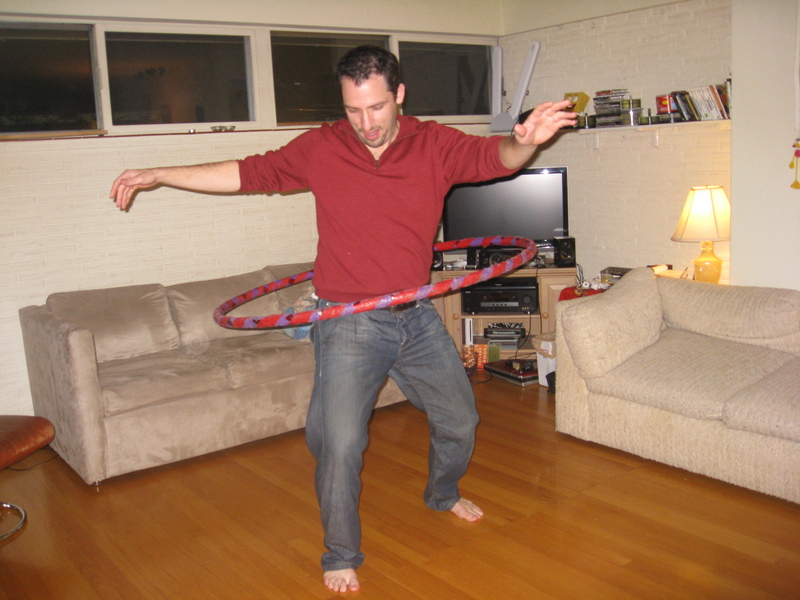 . .
And, of course, eating all that yummy food gives good reason to get moving and do some hula-hooping! On this day of thanks, I’ll be visiting a dear old friend who’s in town. . . wearing a sundress and sandals. . . but I will be giving thanks for all the memories, all the good times–the hugs, the laughs, the delicious food, the warm vibes–and I’ll be thinking of you, and missing you, and eating with you in spirit! May your day be merry and filled with an abundance of love and food, and the kind of company that makes your heart sing!